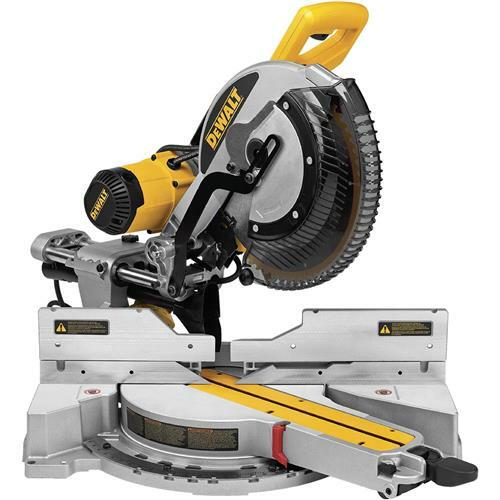 The DEWALT DWS780 12" double bevel sliding compound miter saw expertly walks the line between the rugged durability and fine precision that professionals need on the job site. The DWS780 miter saw features extremely solid construction and the new XPS cross-cut alignment system that features an improved ultra-bright LED light, which casts a laser-like shadow on the work surface and shows the user precisely where the blade will come in contact with the material. This unique alignment system requires no recalibration over time or after changing blades, which makes it more accurate and durable than traditional laser guides. The saw features a powerful 15-amp motor that delivers 3,800 RPM. The power cord is routed through the rail in the back, eliminating interference with the slide. Additionally, the saw offers an industry-leading combination of cut capacities, which includes 6-3/4" vertical capacity, 7-1/2" nested crown capacity, 13-7/8" horizontal capacity, and exclusive back fence design that cuts up to a 2" x 16" at a 90° angle and 2" x 12" at a 45° angle. To simplify and maximize vertical cutting capacity, the unit includes a rail lock latch for holding the head away from the fence. Carbide blade, blade wrench, dust bag, and vertical material clamp also included. I bought this saw a few months back to replace a craftsman 10" slider. I am a part time custom cabinet maker that uses this saw a lot. It is an amazing saw with loads of power! The blade shadow lighting is amazing for that perfect cut! I highly recommend this saw! !